Preheat oven to 375 and line 2 cookie sheets with parchment paper or a silicon mat. Scrape the inside of half of vanilla bean, with a dull knife. Gently rub the vanilla beans, by hand, into 1 cup of sugar until the vanilla beans are fully incorporated and the sugar is fragrant. In a medium mixing bowl, sift together: flour, cornstarch, baking powder, baking soda and salt. Re-sift these dry ingredients together 3 times! In a large bowl, beat together the room temperature butter and the vanilla sugar for 2 minutes, until light and fluffy. Once the butter/sugar mixture is light and fluffy, beat in the egg, followed by the vanilla extract and the lemon extract. Once the batter is thorouhgly mixed, reduce the speed of mixer to low. Gradually, on low speed, add the flour mixture to the wet mixture until just combined. Do not over-mix. 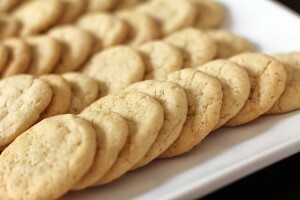 Drop rounded teaspoons of the dough on the lined cookie sheet. In order to prevent the dough from sticking to the teaspoon, dip the teaspoon in water prior to scooping the dough. Gently flatten each cookie slightly prior to baking. Bake cookies for 8 minutes, until the cookies are lightly browned along the edges. How did I not notice Allen doesn’t like chocolate? Hmm… I was planning a chocolate dessert for French Supper Club. I think I’ll keep Allen’s for myself – you’ll miss your double dessert that night.